Jenny Dubnau is obsessed with the act of looking. Her imagery is derived from intimate photography sessions with people who are close to her. She believes "that the experience of being photographed places the subjects in the rather uncomfortable position of being gazed at through a camera, sitting under hot lights, and told to 'pose'." oil on canvas 24" x 24" each panel. 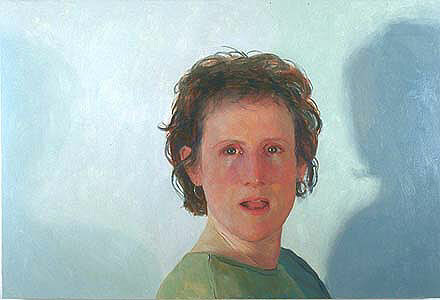 oil on canvas, 30" x 44"
Indeed, her subjects appear bored, surprised, annoyed and definitely uncomfortable  presented in typically unflattering light and placed rather unceremoniously against a stark white or gray backdrop.Steeped in the rich tradition of portraiture, Dubnau's work clearly draws on traditional oil technique. The loose, almost rough brushwork congeals into shockingly tight renderings of the figure. oil on canvas, 46" x 56"
However, her unapologetic approach to the body as living organism keeps the work far from the conventional side of figure painting. The liberal use of wide, flat brush strokes of blue or green in the flesh suggests the veins pulsing underneath. 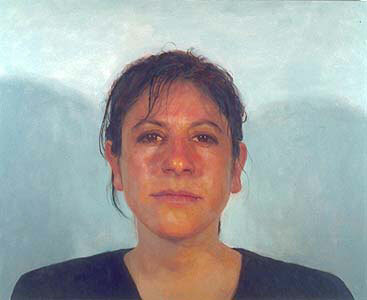 And, the artist paints her subjects' moles and pimples with the same relish as their more appealing attributes  a not too subtle reminder that we are indeed mortal.